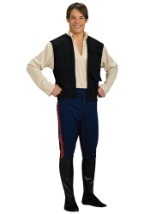 Looking for a unique Star Wars costume? Then this adult tauntaun costume is perfect! This adult size inflatable taun taun costume includes a gray polyester taun taun piece that fits around the waist with an adjustable drawstring. Your legs fit through the tauntaun legs and elastic bands keep them in place. A small hole fits the fan mechanism, which inflates the costume with a battery operated fan (instructions are included). 4 AA batteries (not included) fit into the power pack, which attaches to your clothing. When inflated, the costume recreates a taun taun, with the classic tan face features on the head, two horns poking out of the sides of the head and a pair of perky ears. A tail pokes out in back and two little taun taun arms poke out in front. Little inflatable legs fit into the brown stirrups along the side. Also available in a child size!